Days after report says France is the world's most dangerous country for Jews, CRIF reveals huge increase in anti-Semitic violence in 2014. The number of anti-Semitic acts doubled in France during 2014, with acts involving physical violence leading the increase, the country's main Jewish group said on Tuesday. Some 851 anti-Semitic acts were registered in 2014, compared with 423 the previous year, with acts of physical violence jumping to 241 from 105, the CRIF said. The numbers were released as world leaders readied to mark the 70th anniversary of the liberation of the Auschwitz death camp in Poland and less than three weeks after Islamist attacks in Paris left 17 people dead, including four Jewish men taken hostage at a kosher supermarket. 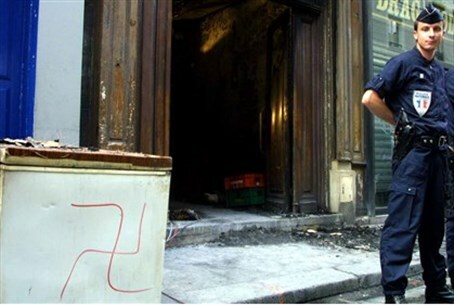 "These anti-Semitic acts represent 51 percent of racist acts committed in France while Jews make up only one percent of the French population," said the group in a statement, according to AFP. France is home to Europe's largest Jewish population, estimated to be between 500,00 and 600,000, as well as the continent's largest Muslim population, estimated around five million. The CRIF group said there was a "very significant and very worrying increase in the violence of anti-Semitic acts" and warned that "anti-Semitic" prejudices were rife in the country. The results mirror a report from the World Zionist Organization (WZO) Sunday stating that France is the most dangerous country in the world for Jews. The anti-Semitism has flared particularly intensely during Operation Protective Edge, with violent protests in Paris. In a similar incident, hundreds of Muslim extremists attacked a major synagogue in Paris, provoking clashes with Jewish youths who rushed to defend the site and worshippers trapped inside. French President Francois Hollande later Tuesday paid tribute to the some 75,000 French Jews deported to Nazi death camps during World War II. Speaking with a handful of Holocaust survivors and their young relatives, he urged them to spread the word so that the crimes are not forgotten. "It's very important that you take young people to show them where you were ... What the Nazis wanted to do was to destroy all traces" of the Jewish people, added Hollande.